Today I picked the first tomato from our garden! 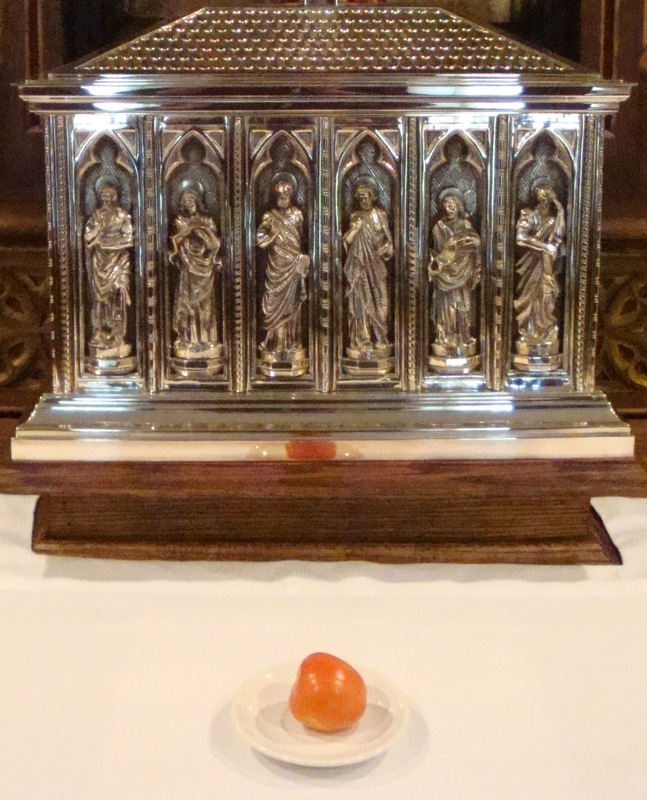 As our beloved Mother Angelica taught us, before we eat it, we always take the first fruit and place it before Jesus in the Blessed Sacrament, to thank Him for blessing our garden and making it grow. It seems appropriate that today begins the Holy Spirit Novena (which we will be posting each day). 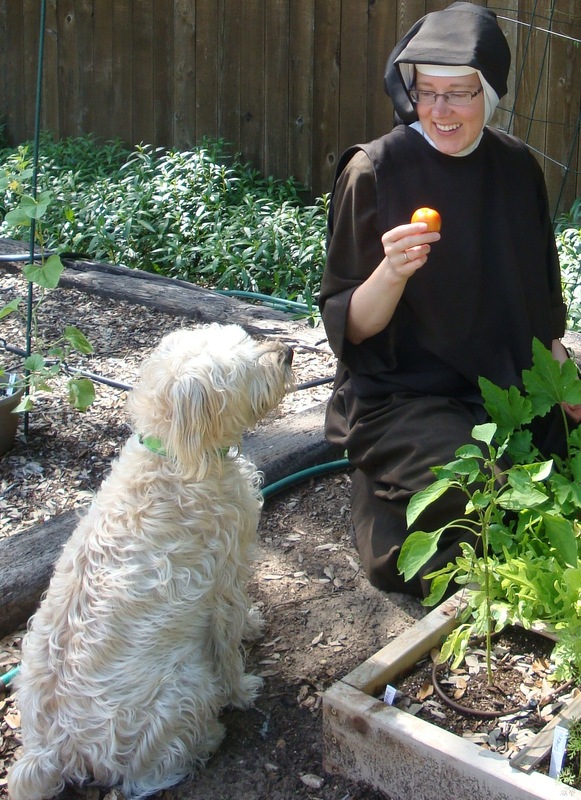 When I’m in the garden I often think of the story Rev. Mother used to tell us, and which is in Raymond Arroyo’s biography, of the time she checked a book out of the monastery library called Fruits of the Earth. In those days they were pretty strict checking out books: you could look over a list of title and choose your book from that, and you had to keep it until the next week. Without looking at the book, just seeing the title on the list, she thought Fruits of the Earth sounded like a great book about the Holy Spirit. When the librarian handed it to her, however, she was disappointed to find she had just checked out a book on gardening. We tried gardening the first couple years after we moved here and it went well, but then we must have lost our gardening grace, because after that things didn’t go so well. The veggies that everyone says grow like weeds here wouldn’t grow for us. So this year we tried something different to see if we could get better results. We bought the Square Foot Gardening book, went to Lowe’s and bought the supplies, and I built a 4’x4′ garden. (I don’t care what anyone says, forget diamonds, power tools are really a girl’s best friend.) I even followed the directions scrupulously to make Mel’s Mix, the amazing soil that’s supposed to make your garden grow like mad. So when my mom said that her tromboncino squash was 7 feet tall, I looked at my little midget tromboncino plant and thought “What happened?” I was worried too, about my yellow squash, which seemed like it was never going to produce anything. My mom reported loads of yellow squash on her plant; and I was about to pull my plants out of the garden because I thought they were defective. Last week when I finally noticed a little yellow squash I was thrilled – and very glad I hadn’t thrown the whole plant out. My tromboncino is finally taking off, and today I picked the first of many tomatoes that are growing in the garden. There’s nothing more rewarding than finally being able to harvest the fruit of your labor, after nurturing it and watching it grow. I’m sure many of you have amazing gardens and lots of produce, and I’m looking forward to building up my gardening knowledge as the years go by (I’m definitely not a natural), but for now we’re quite happy with our one squash and our first tomato. 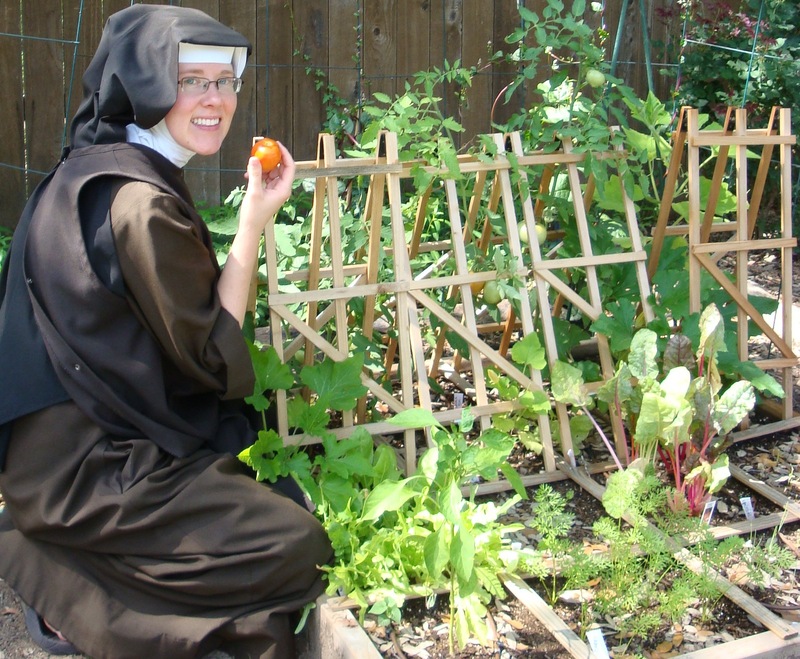 This entry was posted in A Nun's Life and tagged gardening, Holy Spirit, Mother Angelica, nuns by srelizabeth. Bookmark the permalink. The garden looks great. Nothing can compare to the tase of home grown tomatoes.